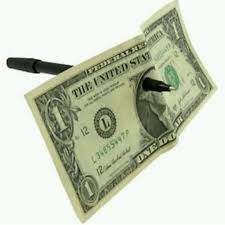 There are many clever effects where a pen penetrates through a paper bill. This one is excellent - no duplicate pens, no switches, and the pen can be examined. A magic pen that penetrates through a paper bill or a borrowed coin. It can change coins with a tap, or twists around end for end under the cap. Complete and ready to use with photo illustrated instructions for four amazing magic effects.